In the late 1970s, I was a teenager in Toronto, madly in love with music and books. I read mysteries and thrillers, devouring anything by Ruth Rendell, Agatha Christie, and P.D. James, but couldn’t find novels with rock stars. So I did what I had to do: I decided to write one. I ended up with an ambitious, dramatic storyline, but I knew it lacked maturity and experience and made the conscious decision to shelve it until I could do it proper justice. Life went on for almost twenty years, and a series of events culminated with the re-discovery of the handwritten draft and a desire to bring it to the light of day. Armed with the knowledge and observational skills only time can give you, the time seemed right to redevelop my idea of helping to create a new genre in fiction. 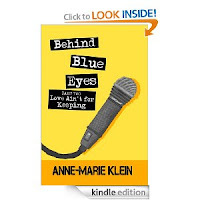 Rewritten, edited, and polished into shape, the Behind Blue Eyes rock novels were published last year, with three of four planned books released. True to the original manuscript, the story begins in 1978, with The Who’s beautiful song as the inspiration for the main character, and Toronto and London as the backdrops. No longer a contemporary tale, the collection now falls into the category of historical or nostalgic fiction, shedding a light on what I fondly remember as a great era for my hometown. The best part of having kept the first drafts is that I avoided the clichés of the 70s with accurate descriptions of the iconic locations that are featured in the story. I have tried to evoke Sam the Record Man, the Terrace, the El Mocambo, and the Yonge Street strip with realism and affection, and have been touched by the response of readers who have identified with the landmarks. When I’m asked how to best describe the series, the standard labels always tempt me—rock novels, family drama, romance, and historical fiction. The most accurate answer always comes from the heart, though: it is my love letter to Toronto and to music. 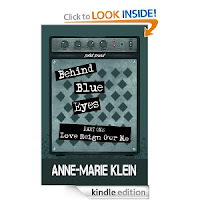 Behind Blue Eyes is a four-part series following a young musician's turbulent life as he makes his rock and roll dreams come true in a city far from where he grew up. 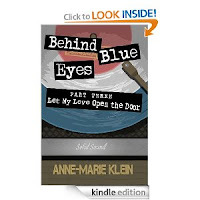 Equal parts family saga, love story, and rock and roll circus, this first novel will take you back to the late 70s in Toronto for a dramatic roller-coaster ride through the world of music. Keep your eyes out for book four! Well done, Anne Marie. I like that! A love letter to Toronto and to music. Very fitting description.